Home > Past Buzz > Marriott Ridge H.S. Washington D.C.
Colleen Clancy's performance as Carmen Diaz was one of the highlights in Marriotts Ridge High School's production of "Fame: The Musical." What is the "hardest profession in the world?" According to the cast of Marriotts Ridge High School's "Fame: The Musical," it's putting on a show packed with singing, dancing, learning and all the troubles of growing up in New York's famous School of Performing Arts. "Fame" follows members of the talented, ambitious Class of 1984 as they learn about their crafts -- and themselves -- over four years of high school, balancing acting, music and dance with "Hard Work" and having fun. The production at Marriotts Ridge featured an upbeat, enthusiastic ensemble that seemed to fill the halls of PA. 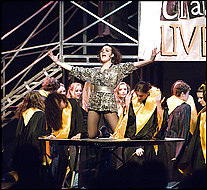 The entire cast showed adeptness for choreography: Numbers such as "Hard Work" and "Dancin' on the Sidewalk" brought out the maximum energy of every person onstage. While the ensemble blended nicely, standout performances were given by Colleen Clancy as Carmen -- "not the movie, not the opera, but the human being!" Clancy melded perfect amounts of attitude and insecurity to create a fragile character with big dreams, evidenced in her powerful solos, "There She Goes!/Fame" and "In L.A." Clancy got laughs in the "introductory ballet" scene, dancing wildly with Theiry Banks (who played the troubled Tyrone) while everyone else perfected their nimble steps. Banks also shone in "Tyrone's Rap," using vocal and physical energy to channel the disgruntled young man's anger to his dance partner, Iris (Kathleen Molinaro). But the real dancer in the spotlight was Kelly Harrigan as Mabel Washington. Another dancer who stood out was Abby Schwarz as teacher Greta Bell. Her elegant movements conveyed a fiery spirit in "The Teacher's Argument." Although the actors battled serious microphone issues, cast members doubled their vocal energy in the second act to compensate. The "Fame Band" sounded like a professional recording. The classmates in "Fame" may think that they're "gonna live forever," but, as in life, the Class of '84 must move on. The Marriotts Ridge cast, crew and band did an excellent job with their production about growing up in a tumultuous decade -- and as the teachers in "Fame" instructed, they did it with a tremendous amount of "Hard Work."